Perhaps you may have known that a moderate amount of red wine consumption is good for your heart. But do you know that red wine is also a surprising great way to stay young and get brighter and healthier skin? Red wine contains high levels of antioxidants such as resveratrol and polyphenols, which are beneficial in helping you to get a brighter and healthier skin by minimizing fine lines and wrinkles. Generally red wine when used in skin care products is for the purpose of fighting free radicals, stimulating blood circulation, skin rejuvenation, increasing skin elasticity, skin tightening and whitening with the ultimate aim to keep your skin bright and glowing. Also in cases of eczema and acne, red wine is also considered to be quite effective in detoxifying the skin and preventing your skin against these kinds of skin disorders. The following are some recipes for a brighter and healthier skin using red wine as the base ingredient. For this recipe, you will need 1 cup of organic plain yogurt, 5 tablespoons of red wine and 2 tablespoons of raw organic honey (or manuka honey). You combine the three ingredients in a small mixing bowl and mix together with a whisk. Once blended well together, apply the face mask to your face and neck. Leave on for 20-25 minutes then rinse off with warm water and gently pat dry with a soft hand towel. Follow with an oil-free moisturizer on your face and neck. Organic plain yogurt is great for the skin because it will leave your skin glowing due to the low amount of acidity in it, which will restore your natural pH balance. It is also great for adding hydration to the skin and is great for soothing sunburns or irritated skin. Make sure you don’t use a reduced-fat or non-fat yogurt. Organic is important too since no chemicals or pesticides are added which can irritate your skin. Raw organic honey (or manuka honey) is loaded with anti-microbial properties and is a natural antioxidant. Honey fights microbial infections that cause acne without irritating your skin. Honey also pulls out impurities from your pores that would normally stay clogged, festering bacteria that causes pimples. It will also help restore your skin’s texture and reduce damage done to your skin by the sun and daily environments you come in contact with. For this recipe, you will need 1 egg white, 3 tablespoons of red wine and 1 tablespoon of raw organic honey (or manuka honey). You gently mix the egg white, red wine and honey together until you get a smooth paste. Spread the paste gently and equally with your fingertips on your face and neck and carefully avoiding the area around your eyes. You leave this paste on your face for 10-15 minutes before you rinse it off with lukewarm water. The egg white and red wine in this mask form a super skin toner which can work to tighten your skin. On top of that honey is the perfect natural humectant; it attracts moisture and keeps it there where it should be: under your skin. It has a soothing and smoothening effect on your skin. 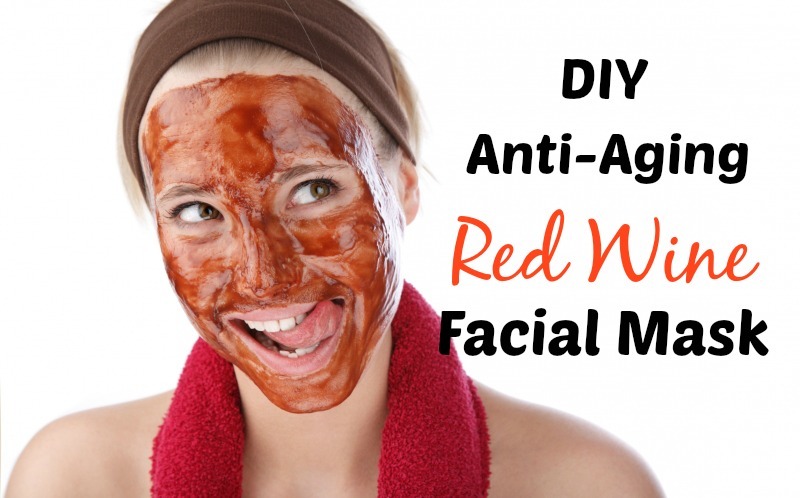 This red wine mask will make your skin look younger, extra vibrant and leaves it silky smooth. For this recipe, you will need 1 tablespoon of red wine, 1 teaspoon of green tea powder and 1 teaspoon of dark cocoa powder. You mix all of them together to form a paste. If the mixture becomes too thick, you have to add some more red wine until you get a smooth paste. If you have dry skin, you can also add in 1 tablespoon of raw organic honey (or manuka honey). You spread the paste on your face, carefully avoiding the area around your eyes and then you rinse it off after 20 minutes. By doing this twice a week, you will eventually have a brighter and healthier skin. Green tea contains a cocktail of potent antioxidants called catechins, which help fight damage caused by free radicals. Free radicals can form in your skin for a variety of reasons, including exposure to toxins. However, the most common cause of free radicals in skin cells is UV radiation from sunlight, which causes up to 90% of all signs of premature aging. In several scientific studies, green tea extract was shown to neutralize the damage done by exposure to UV rays. The flavonols (the type of flavonoid found in dark cocoa powder) help your skin look its best. Flavonols are antioxidants that help your skin protect itself from UV damage (fewer wrinkles as a result) fight free radicals (prevent sun spots) and increase blood flow (giving you glowing complexion). In one study, flavonols in dark cocoa powder even improved skin hydration and thickness—both of utmost important for young-looking skin.